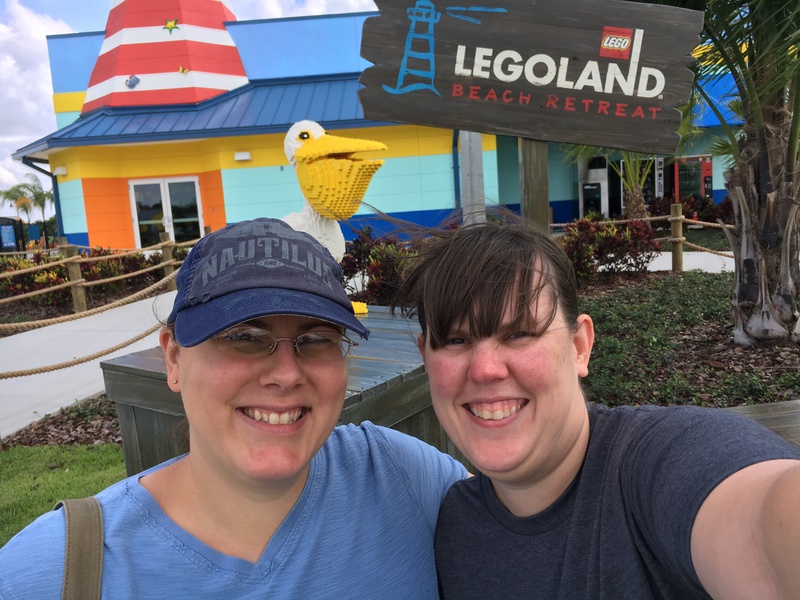 We got to stay at the brand new LEGOLAND Beach Retreat at LEGOLAND Florida and had a blast! 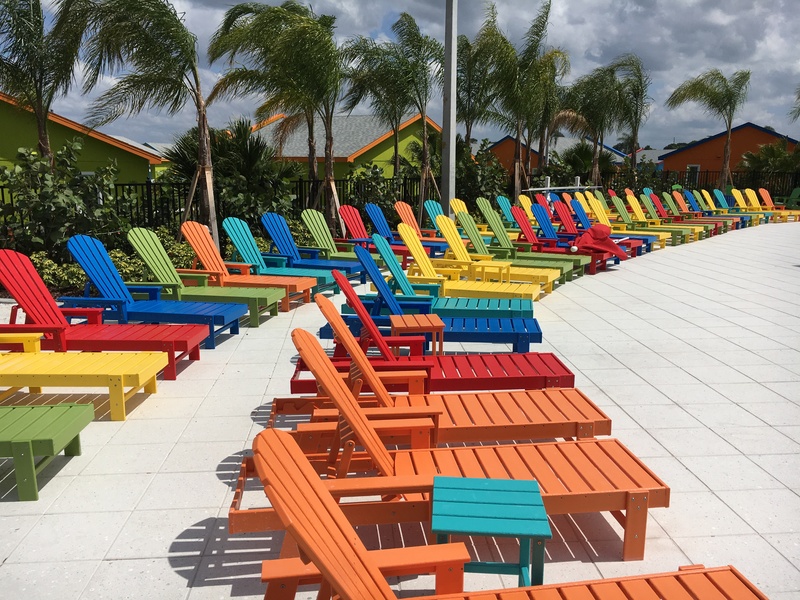 Here’s our sincere thoughts on the new resort, our beach bungalow, the resort’s restaurants and amenities as well as a whole lot of photos from our trip. 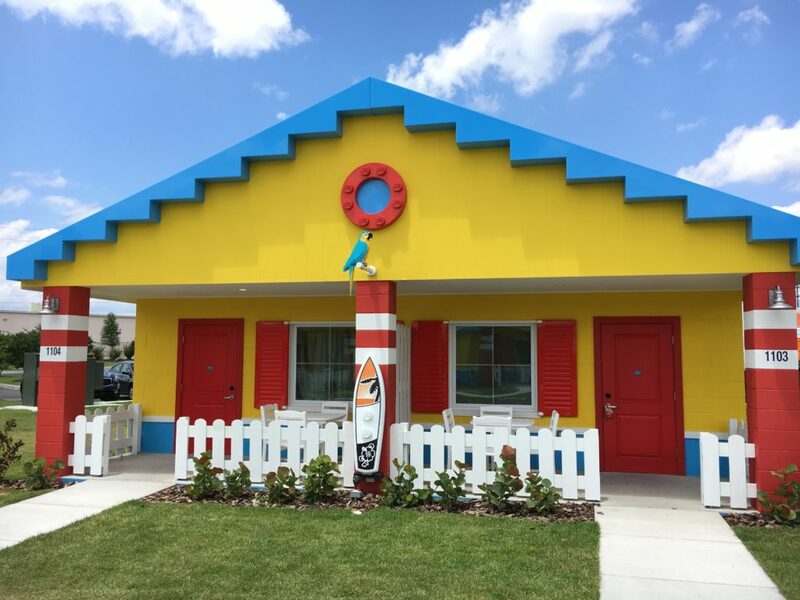 LEGOLAND Beach Retreat opened April 7, 2017, and features 83 beach-themed bungalows, each with two rooms, for a total of 166 separate rooms. The brightly colored bungalows are grouped into 13 sections, each named after a popular LEGO Minifigure including Shark Suit Guy, Ocean King, and Sea Captain. 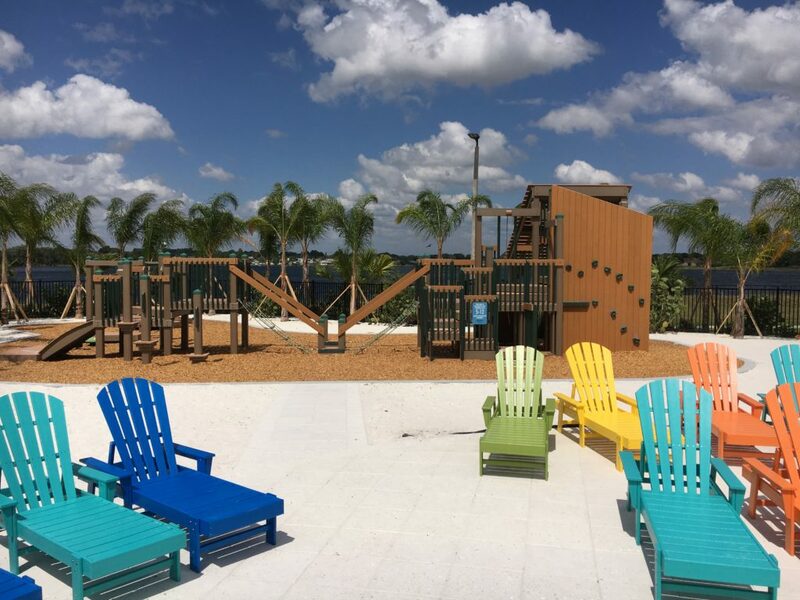 Every cove has its own playground and parents can keep an eye on their kids from the comfort of their very own porch in front of their room. 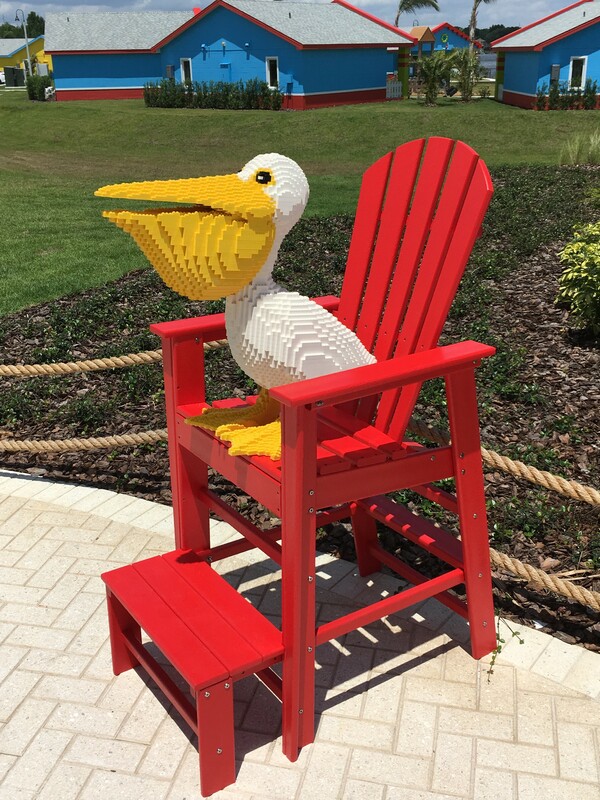 The resort is located across the street from LEGOLAND Florida and offers a free shuttle to the park. 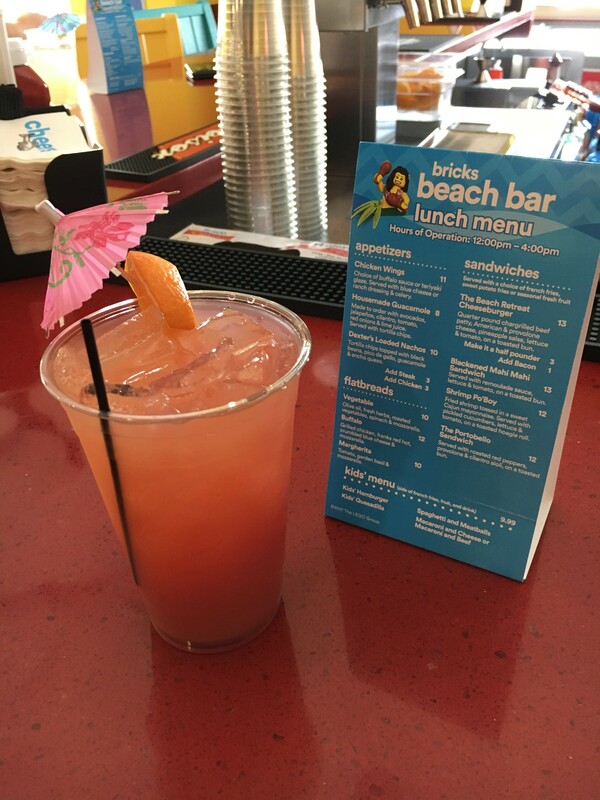 Your stay includes a free breakfast buffet, access to the pool, and (our favorite) the Bricks Beach Bar with signature mixed drinks. 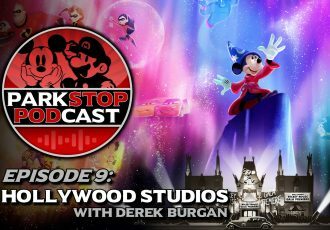 Check out our full review below, including coverage of all the different areas of the resort and a photo gallery from our stay! 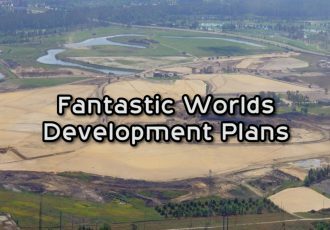 And stay tuned for more theme park news and coverage coming soon. 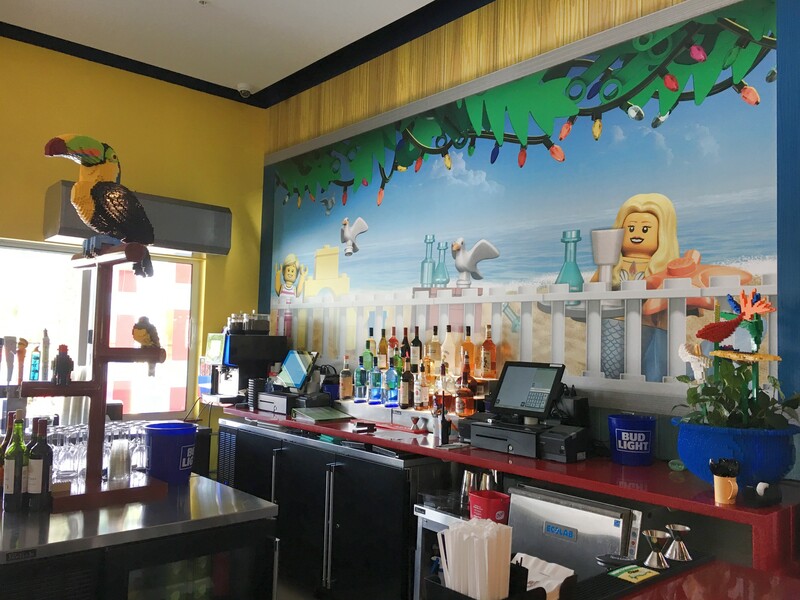 We had the pleasure of staying at the LEGOLAND Hotel when it first opened and the LEGOLAND Beach Retreat is a very different experience, even though it includes much of the same amenities. One of the first differences is that you actually check in to the Beach Retreat through a drive-through window when entering. There is no traditional lobby for this resort. It’s part of the laid-back charm of the Retreat. And laid-back is a good way to describe the Beach Retreat. It’s much quieter than the LEGOLAND Hotel. By having the beach bungalows separated into coves, which are like small neighborhoods, and by only having two rooms per bungalow, it’s a much more relaxing and quiet place to stay. By contrast, the hotel features many rooms per floor and several floors of rooms. They all must share the same elevators and pass through the lobby to enter or leave. The seclusion and quietness of the Beach Retreat certainly helps to set it apart from its hotel counterpart across the street. 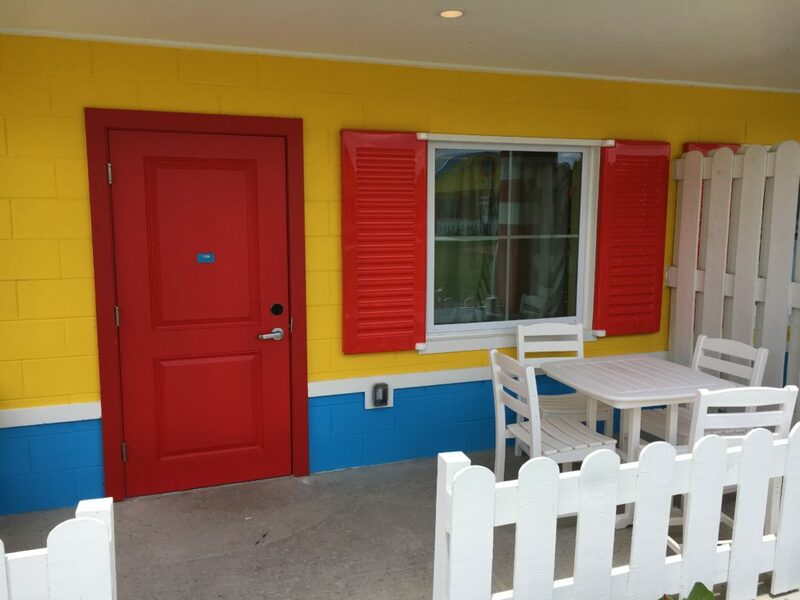 Of course being across the street from the LEGOLAND park could also be considered a con for this resort. It is nice being able to just walk next door to go to the park when staying at the hotel. At the Retreat free shuttles are available in the morning and also starting three hours prior to park closing for return. If you choose to drive to the park yourself, (about two minutes away with traffic lights,) you do get to park in the closest parking spaces possible to the park, which is nice. 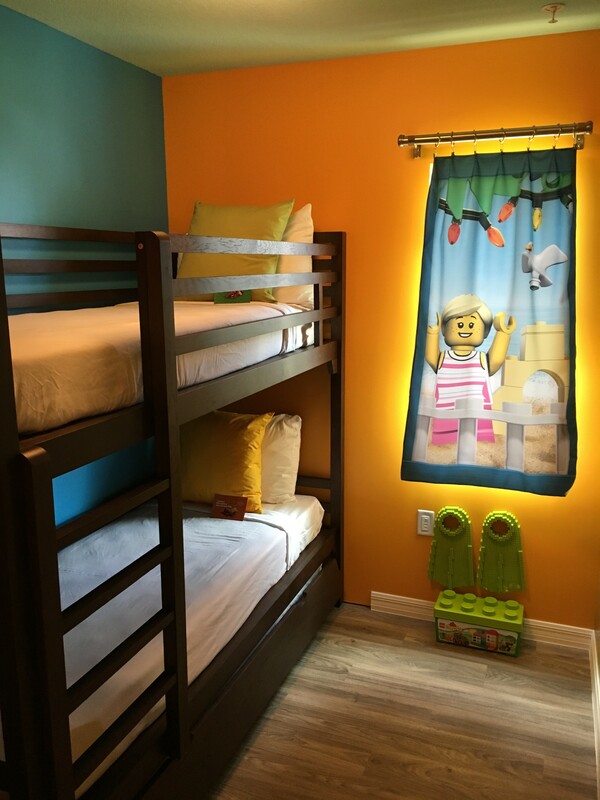 The rooms are similar to the LEGOLAND Hotel, with a king size bed for the adults and a separate area for the kids featuring bunk beds and a pull-out trundle bed. For a somewhat small room you can still sleep a family of five, so that’s nice. 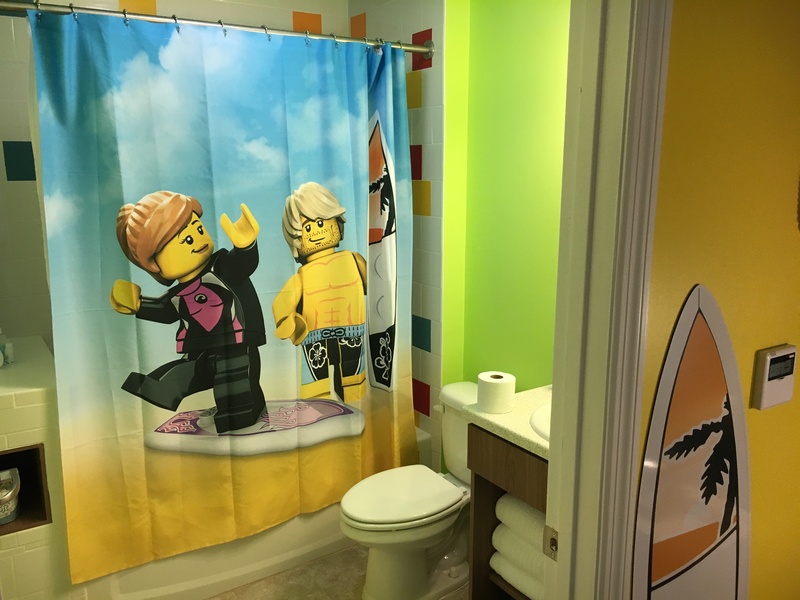 The rooms are highly decorated with murals and LEGO Minifigure characters on all of the curtains, including the shower curtain. 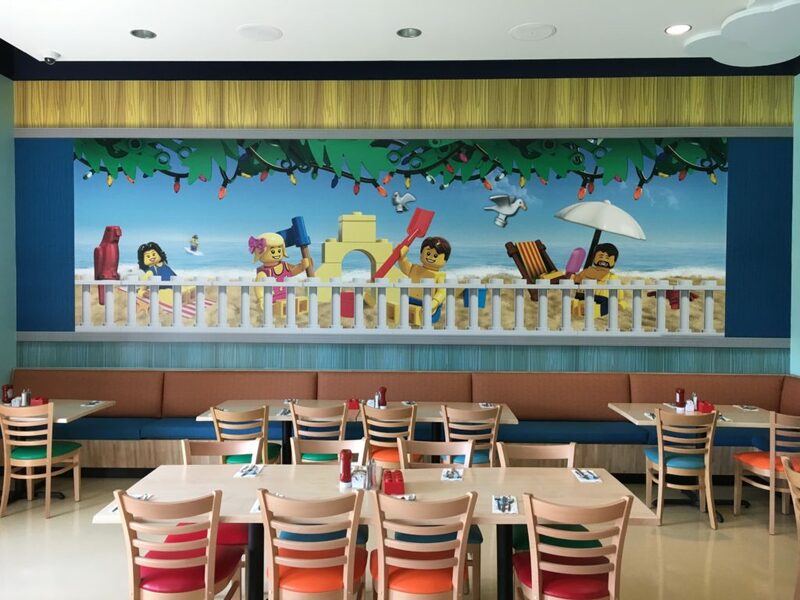 Large-scale LEGO surfboards adorn the walls as well as a LEGO-built crab. 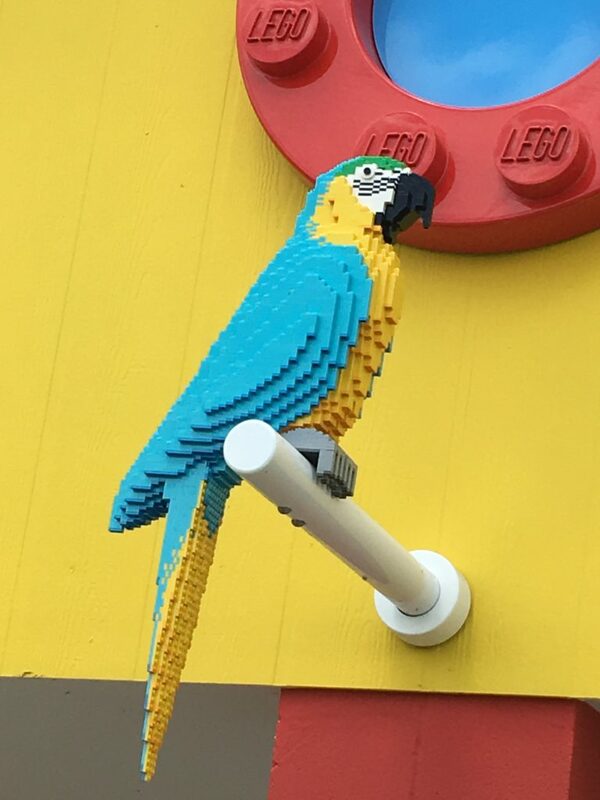 There’s some LEGO flippers on the wall in the kids’ room too. 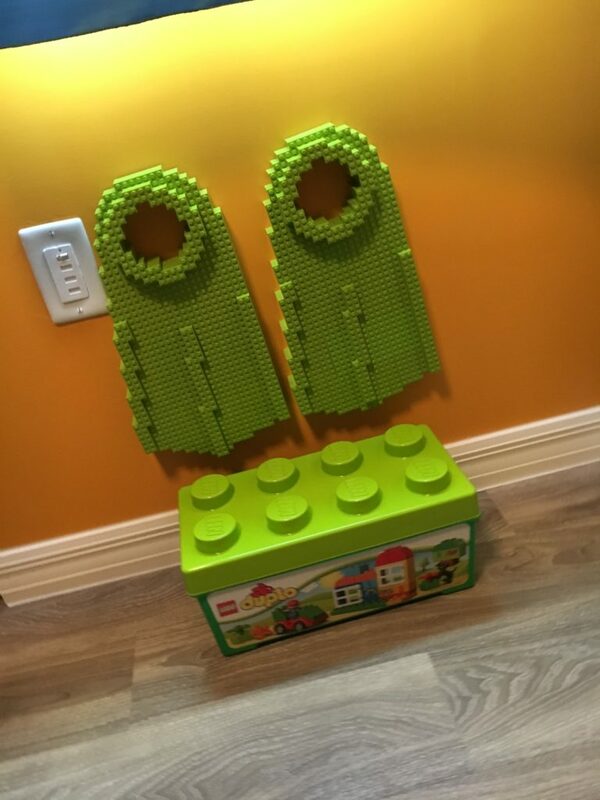 A box of Duplo blocks comes with the room to help keep the kids happy. There aren’t any gifts or take-home toys like we got at the LEGOLAND Hotel however. 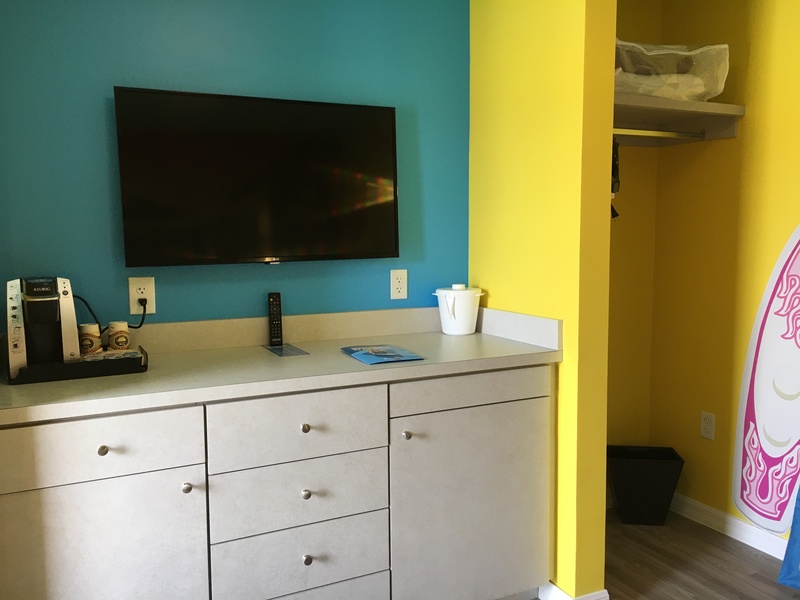 The room includes a small fridge, (a big plus in my book,) as well as a coffee pot with single serve cups (including hot chocolate for kids!) There’s one TV, (not two like the Hotel has, with one in the kids’ room.) The TV gets lots of channels, including many perfect for families. Movies can be purchased from the TV’s menu system, but they’re way too expensive for my taste. We did have some signal issues at a couple points in our stay, with digital static like a satellite is having interference. It wasn’t that bad, but became quite noticeable during one night of our stay. The bathroom is a good size, especially considering these bungalow rooms can be a bit quaint. Since this resort just opened, everything was still very new and shiny in our room, although I found it odd that we did not have a toilet paper hook or roll holder at all in our bathroom. Maybe they forgot to install one? Or maybe this resort doesn’t have any? We didn’t feel it was necessary to complain, but I did find it odd. 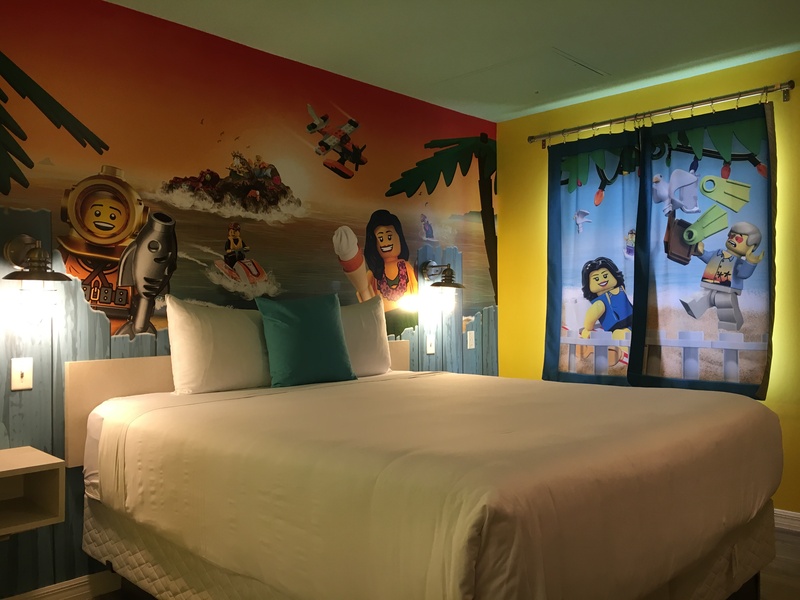 Unlike the themed rooms at the LEGOLAND Hotel, all of the rooms at the Beach Retreat share the same theme, and feature the same designs inside, which is fine. The theme here is the beach. 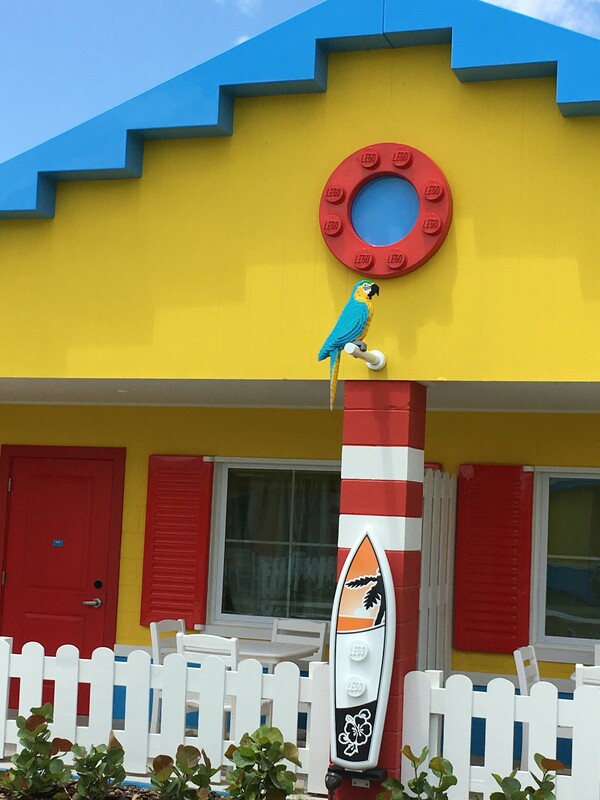 The colors of the outside of the bungalows vary by cove, as do the parrots perched in front of each building. 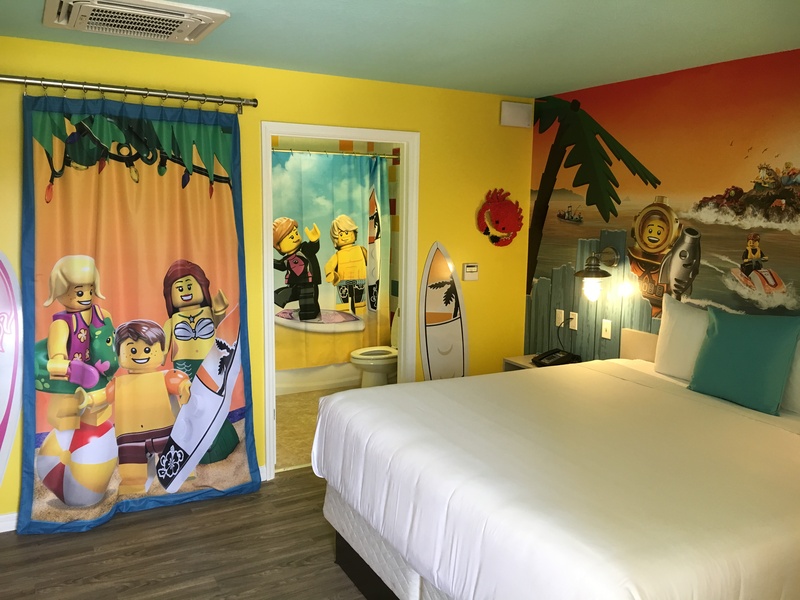 Also unlike the LEGOLAND Hotel, there are no premium rooms available at the Beach Retreat, they are all the same size and contain the same bed types and amenities. The Lighthouse is at the center of the resort. 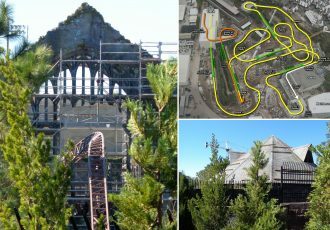 It’s here that you’ll find the restaurant, bar, gift shop, guest service window, and even the vending and ice machines. 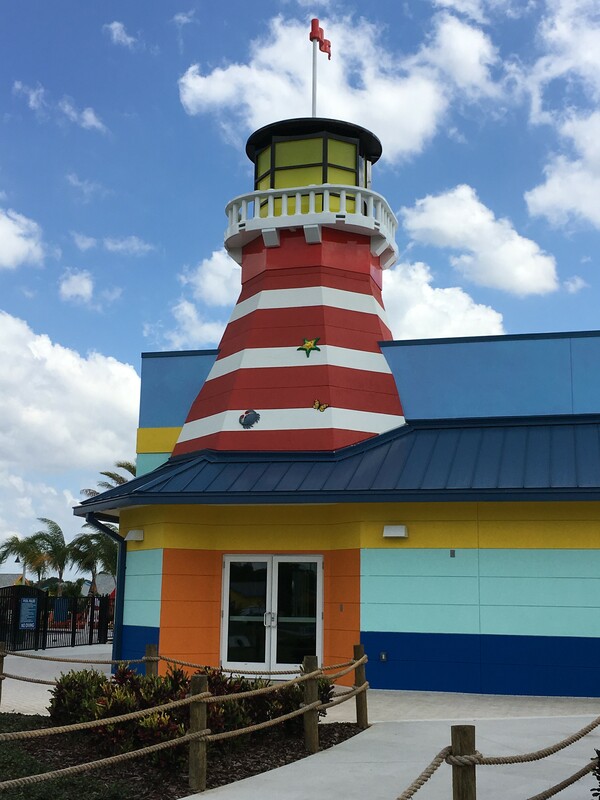 Behind the Lighthouse is the pool and a larger playground for kids. As soon as we entered the building the first thing I noticed was that the gift shop here is a lot bigger than the one over at the LEGOLAND Hotel. 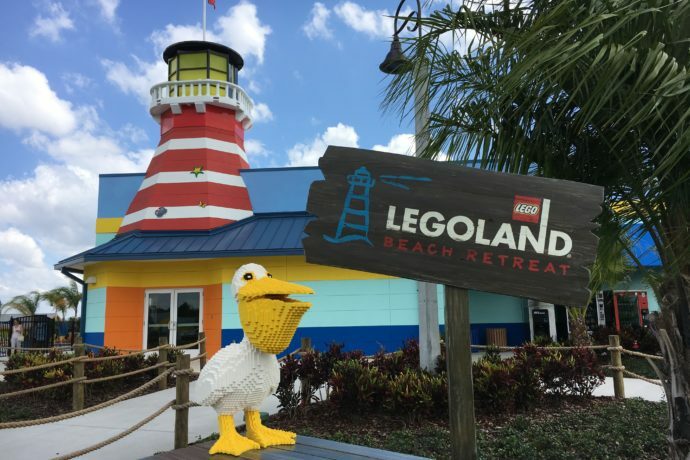 You’ll find bathing suits, towels, flip flops and other beach related items in addition to the LEGO toys you would normally find in a LEGOLAND gift shop. 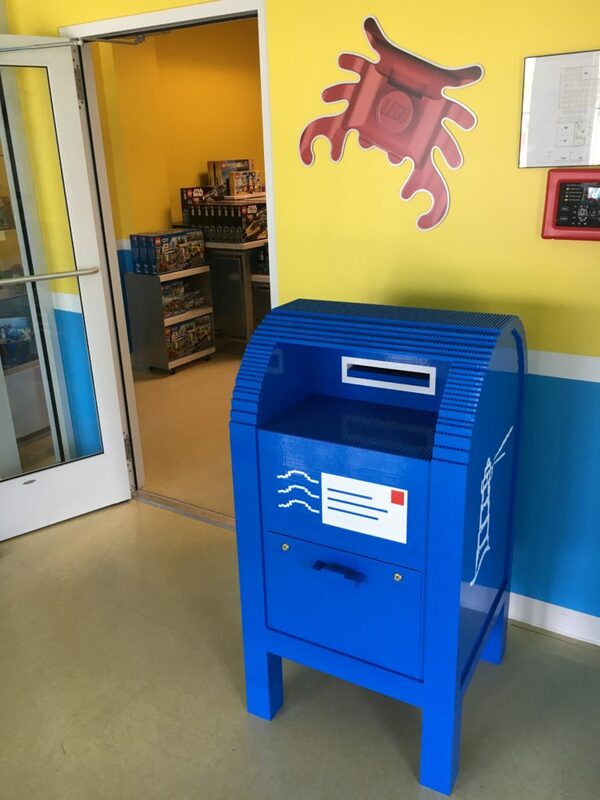 In front of the shop is a real postal mail box, made entirely of LEGO bricks of course. Our bartender, James, was great and offered his honest opinions on the food and drinks before we ordered. The lunch options are limited, but the food here is prepared fresh and is pretty good (which is more than can be said about the buffet, but more on that later.) The Blackened Mahi Sandwich was awesome, and James said the Shrimp Po-Boy is good as well, (something to try next time!) 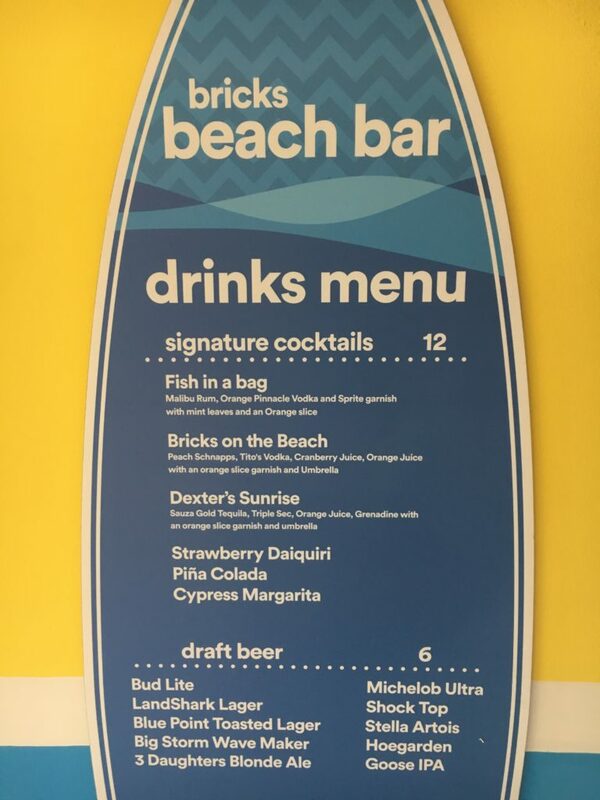 The Bricks Beach Bar can also make pizzas to go, which is perfect for enjoying on your personal patio in front of your room. 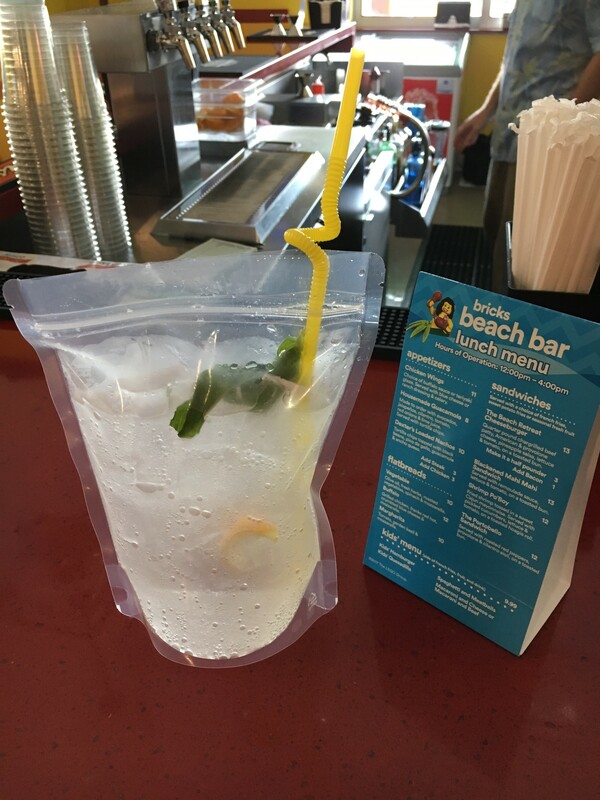 There’s even a bar window for ordering from outside, perfect for when you’re coming from the pool or just want to enjoy the weather. 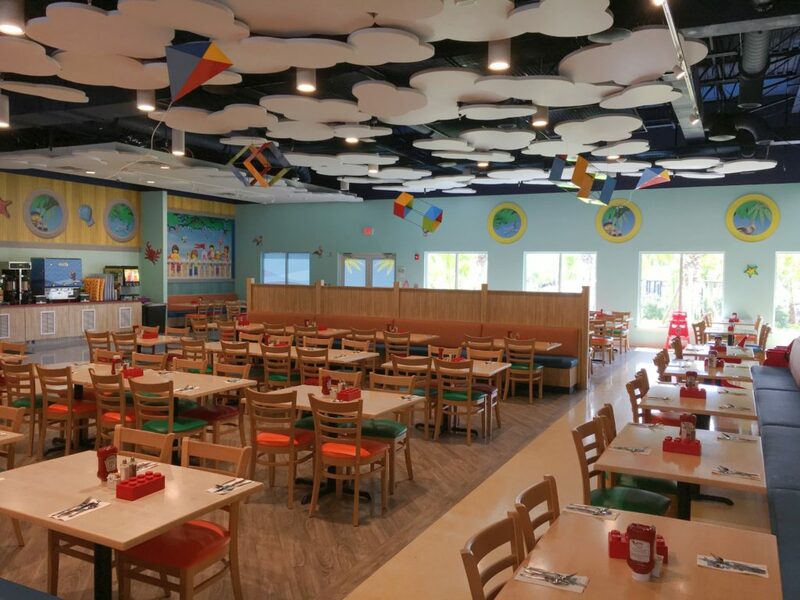 I wish I had as many nice things to say about the resort’s main restaurant, Sandy’s Castle Restaurant, as I do about the bar. Your stay includes a free breakfast buffet for each day of your visit. And even though it’s free, it’s still not worth it. Maybe we caught them on an off week, (it wasn’t very busy while we were there,) but none of the offerings at the breakfast buffet were very good. Foods were either hard from sitting on the heat plates for too long, or just weren’t very good to begin with. The pastries, bagels, and cereals were fine, as they weren’t prepared by the kitchen, but everything else wasn’t very good. Dinner was actually worse. This was a meal we did have to pay for and wish we hadn’t. 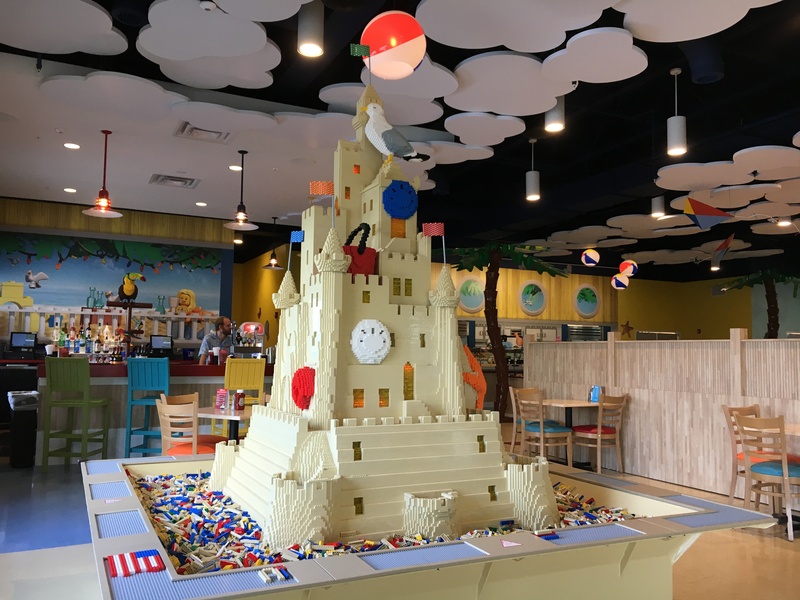 I was really looking forward to the dinner buffet as it was one of the highlights of our stay at the LEGOLAND Hotel a couple years ago. The selection at the Beach Retreat version was much more limited, and again, maybe because it wasn’t as busy, the food was not very fresh. But it was also not very well made. The mahi mahi I had on my sandwich for lunch at the Bricks Beach Bar was delicious, but the mahi on the buffet was flavorless, and it was extremely rubbery from sitting for too long. There’s probably enough on the breakfast and dinner buffets for kids to have their fill, but for just a couple of adults we found it lacking. And again, we actually enjoyed the buffet at the Hotel, so I’m not sure what went wrong here. I feel like a couple simple additions could really brighten up the buffet. Adding some little burgers and hot dogs, a more variety in cooked veggies (we only saw asparagus,) and perhaps having tortillas to go along with the fajita meats, would go a long way to making this a much better dining option… Especially for $19.99 a head. 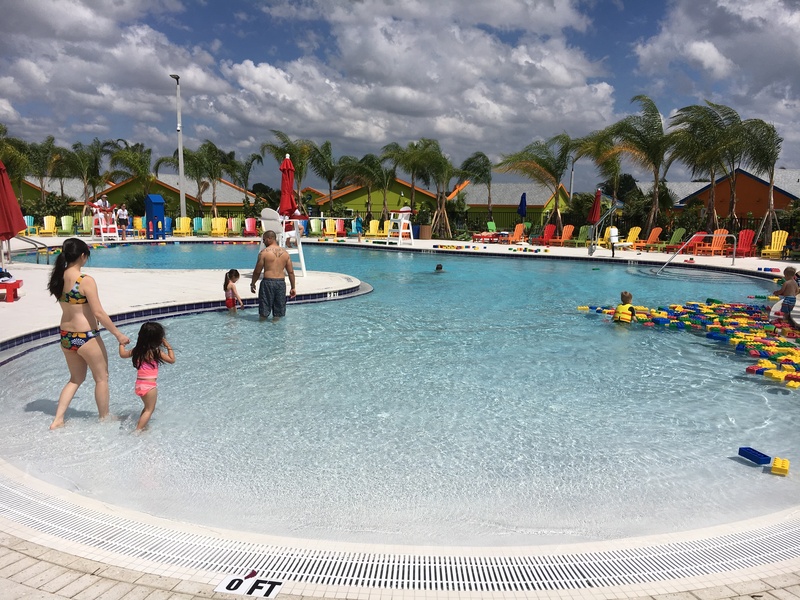 The pool has fun floating LEGO bricks that allow kids to build and play while they swim. 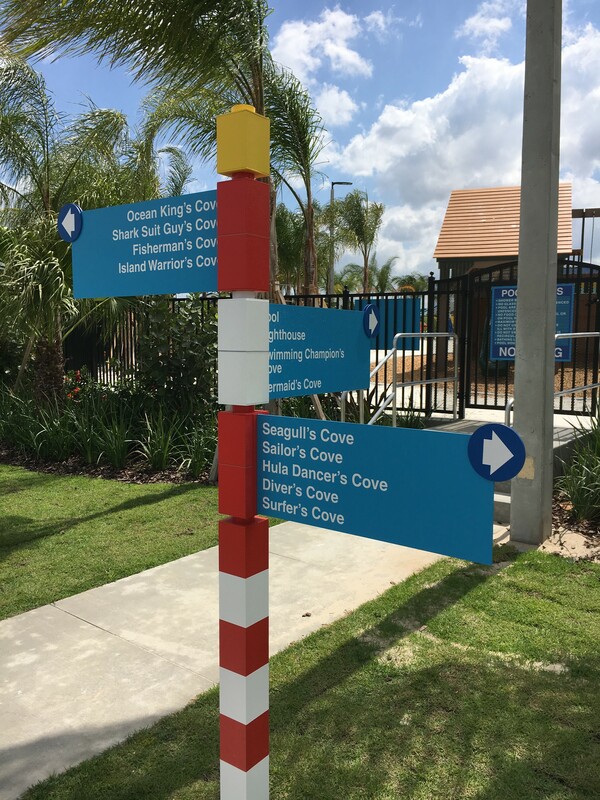 It’s only three-feet deep, but that’s perfect for families and kids visiting LEGOLAND. Around the pool area are many lounge chairs, nets for playing volleyball in white sand, and a playground that’s much larger than the ones in each of the coves. 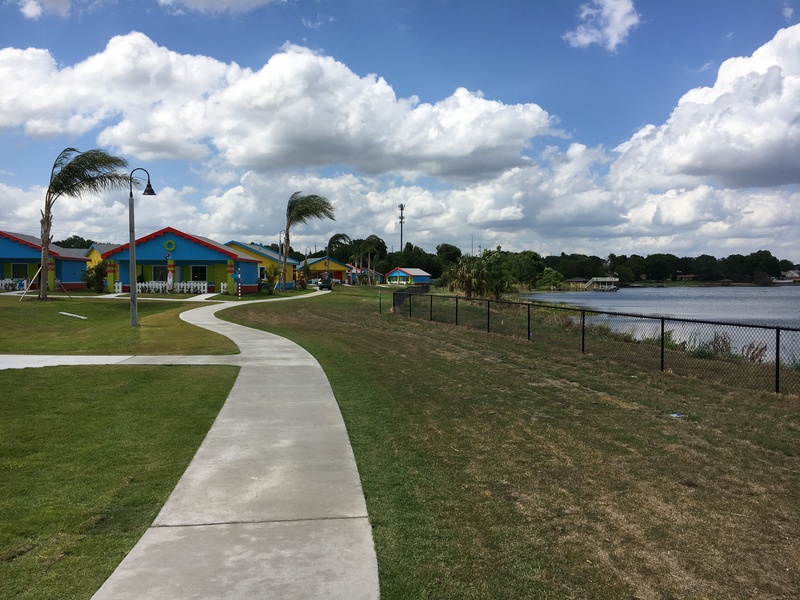 The resort is built right on Lake Dexter and around half of the bungalows actually overlook the lake. We took a nice relaxing walk around the resort and unlike the hotel across the street it’s very quiet and serene here, something we really treasure while on vacation. 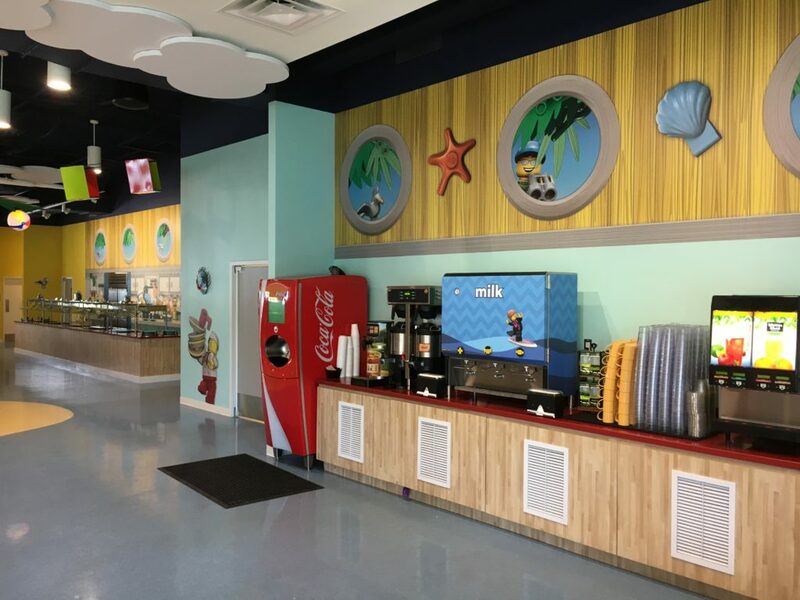 There’s only one location with an ice machine and vending machines for snacks and drinks, and it’s adjacent to the lighthouse building. If you’re in one of the neighboring coves this is no problem, but if you’re in one of the coves further away, it might be somewhat of a hike to get some ice in the middle of the night. Same goes for dragging your luggage from the parking lot, or walking to the shuttle stop to go to the park. I would suggest asking if you could be in a cove directly next to the Lighthouse or pool area to avoid too much unnecessary walking. 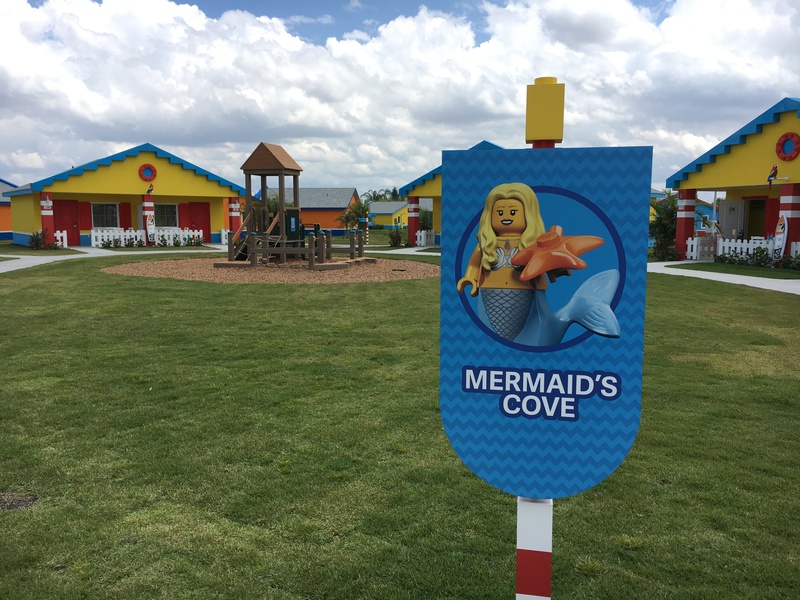 To book your stay at the LEGOLAND Beach Retreat, visit their official website or call (877) 350-5346. Nightly room rates start at $135 (plus tax and resort fee) and vary by season, date and availability. 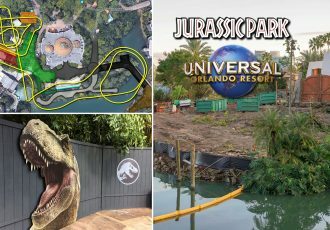 Packages including theme park tickets are also available. 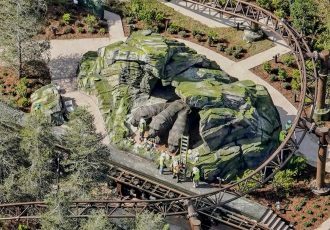 Annual Pass Members receive a 10 percent discount year-round.